The last quarter of 2000 proved to be an exceptionally active one for ASRY — the yard was filled to capacity dur- ing the last year. ued to be a steady with 830,000 sq. m being applied to various vessels. Noteworthy contracts won during the year included the six-vessel block book- ing with Iran Shipping Lines, illustrat- ing ASRY's positive relationship with established customers. Abouzar 1200 into a pipelay barge. The contract, which will be completed this year, sets the standard for ASRY to enter into the major conversion market for offshore oil and gas field contracts. The yard is working continually to diversify its activities and has done so with major contracts for myriad of onversion and upgrade work on a vari- ety of jobs, such as offshore drill rigs, diving support vessels and dredgers. Bahrain Mineral Co.'s Alyia arrived was at ASRY from November - December 2000. VLCC market during that period. The level of repair activity has been high on vessels in the 40,000 dwt to 100,000 dwt class with more than 12 being dry- docked for repairs. 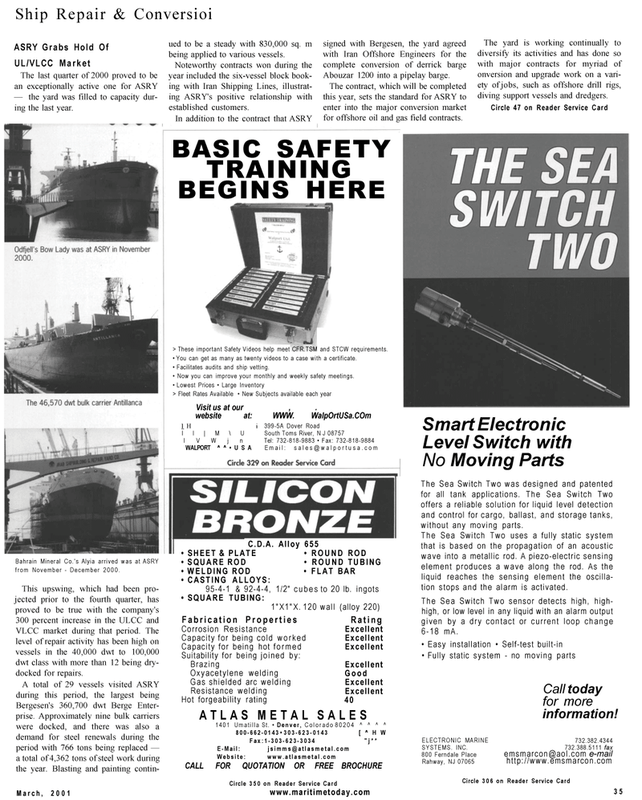 The Sea Switch Two was designed and patented for all tank applications. The Sea Switch Two offers a reliable solution for liquid level detection and control for cargo, ballast, and storage tanks, without any moving parts. The Sea Switch Two uses a fully static system that is based on the propagation of an acoustic wave into a metallic rod. A piezo-electric sensing element produces a wave along the rod. As the liquid reaches the sensing element the oscilla- tion stops and the alarm is activated.